I'm a huge fan of GoT, I've always been impressed with the presence of the Night King on screen. He has yet to say a single word on the show and he's possibly one of the most intriguing characters. This costume was made entirely by me over the span of a couple of months. All told, I'd estimate about 200+ of work. I used a combination of 1/4 inch anti fatigue foam, faux suede, old clothing, hot glue, paint, crafting knife, foam latex prosthetic appliances for the face and neck, bald cap and moldable plastic for the horns, uv LED's & glow in the dark blue contacts for the eyes, plastic pellets for the horns and a great deal of patience. I cut each hole individually for the armor on the shoulders and chest. I had to cut, fold and glue the suede to make the pleated look for the leather on the arms, legs and kilt. The eyes have always been a challenge for anyone doing a white walker and I took a different attack at it. I purchased some uv glow in the dark blue contacts, the challenge was to get them to glow, so I rigged up some small UV lights, hooked up through a 9V battery and a switch. The switch is very important as you do not want UV shining directly into your eyes for any long amount of time. I installed a pocket on the inside of my sleeve and had the battery and switch there so I could turn the eyes off and on. I had the LEDs just under the foam appliance on my face and had them shining down over my eyes. 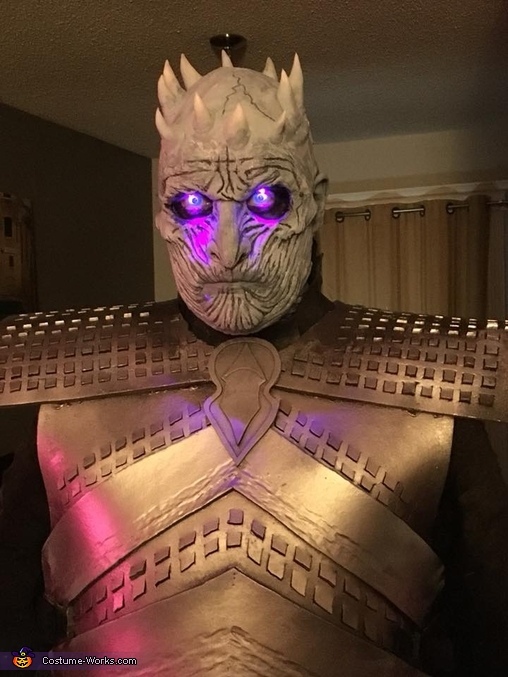 I've researched countless white walker/Night King cosplays over the last few years and I have not seen anyone else do this. The overall effect of this costume was great, I freaked out some, scared some, high fived more and had my picture taken too many times to count.